RMF surged to the top of the leaderboard in 2018Q1, issuing almost $1.1 billion of HMBS securities for a 36.4% market share, $491 million over #2 AAG’s $587.2 million and 19.8% market share. 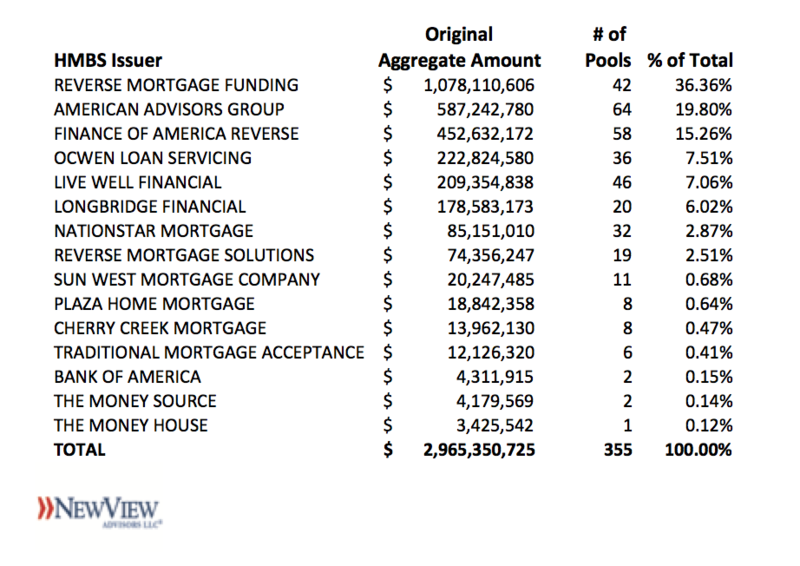 RMF’s totals include the issuance of highly seasoned pools in February. FAR stays in third with $453 million issued and 15.3% market share. Ocwen Loan Servicing and Live Well Financial again round out the top five issuers. Ocwen issued $223 million for a 7.5% market share, and Live Well was fifth with $209 million issued for a 7% market share. The top five issuers accounted for 86% of all issuance, up 6% over last quarter. There were 15 active HMBS issuers in the first quarter. The first quarter totaled $2.97 billion of HMBS, 28% of calendar 2017’s entire issuance, though this belies the true story. Unless highly seasoned HMBS becomes the norm, expect much lower volume for the remainder of 2018 due to the new PLF curves in effect since October. As we have noted previously, tail issuance will provide some profit stability to HMBS issuers to offset this slowdown. HMBS issuance volume totaled $10.5 billion for 2017, just $160 million shy of 2010’s record year of $10.7 billion; those are likely to remain in the record books for the foreseeable future. This entry was posted on Monday, April 2nd, 2018 at 4:16 pm	and is filed under Uncategorized. You can follow any responses to this entry through the RSS 2.0 feed. Both comments and pings are currently closed.